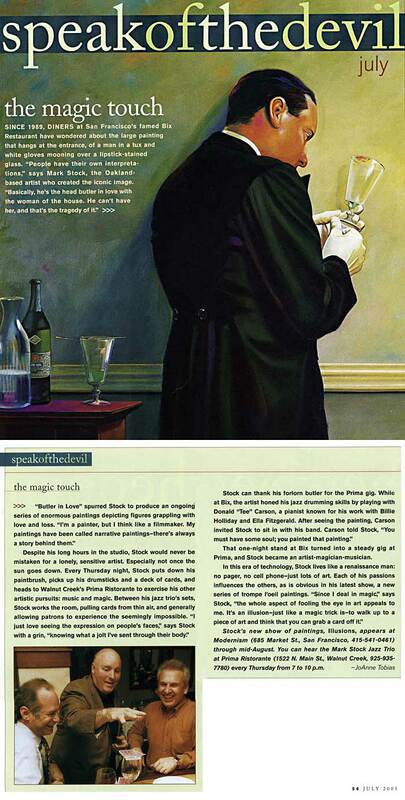 A new feature documentary about Mark Stock, his painting, his music and his magic is currently in production, see trailer. Collaborating with the Bay Arts Documentary Project, Inc. director/producer Wendy Slick is shooting in the Bay Area and Los Angeles. Inquiries or donations can be directed to Ms. Slick. 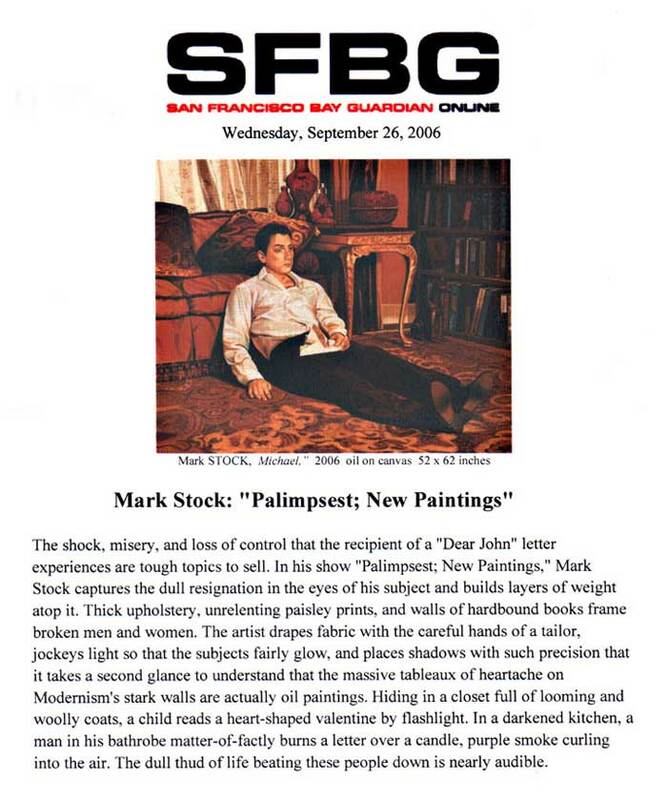 This short, directed by and starring David Arquette, was inspired by the Mark Stock painting in Bix restaurant in San Francisco, which Arquette first saw at his wedding rehearsal dinner there. Arquette honored the "painting he never forgot" by centering the story around it. Also starring Richard Arquette, Elizabeth Berkley, Thomas Jane and Jennifer Siebel, it opened the 2011 Hollyshorts Film Festival in Hollywood. 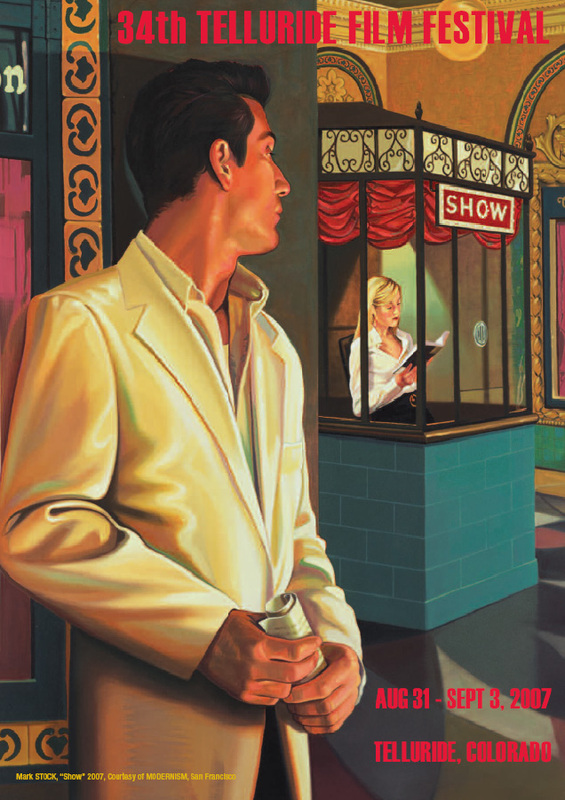 In 2007, Stock was selected to produce a painting for the poster image of the 34th Annual Telluride Film Festival. It was an honor to join the ranks of distinguished artists such as Jim Dine, Julian Schnabel and Gary Larsen who had contributed previous years' Telluride poster images. The image melds Stock's love for film with his recurring theme of obsession. The artist drapes fabric with the careful hands of a tailor, jockeys light so that the subjects fairly glow. 'Nightfall,' a savvy group of paintings constitutes a tone poem on anticipation and ennui. Since '89, diners at SF's famed Bix Restaurant have wondered about the large painting at the enterance. Mark Stock's outdoor murals are the first in a three-part narrative, but he is not telling what it all means. 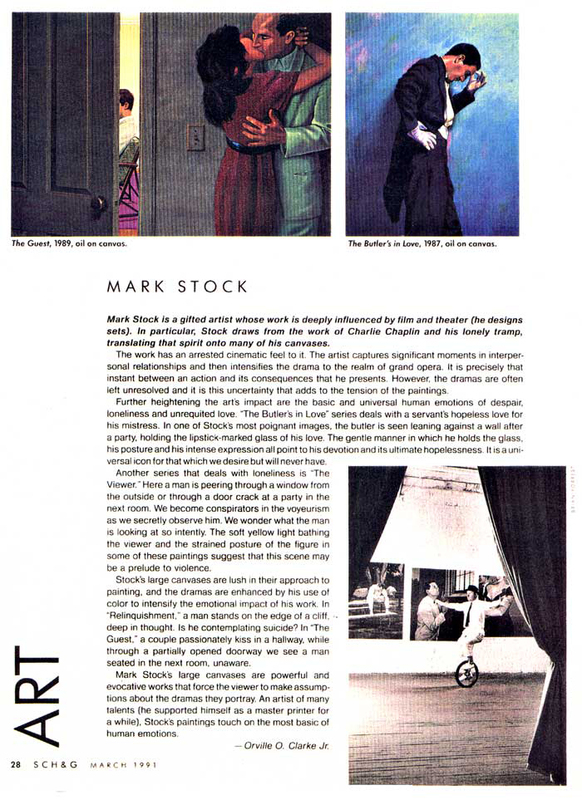 Highly acclaimed artist Mark Stock sits down with CH&D's Ann Seymour to discuss art, life, and love. 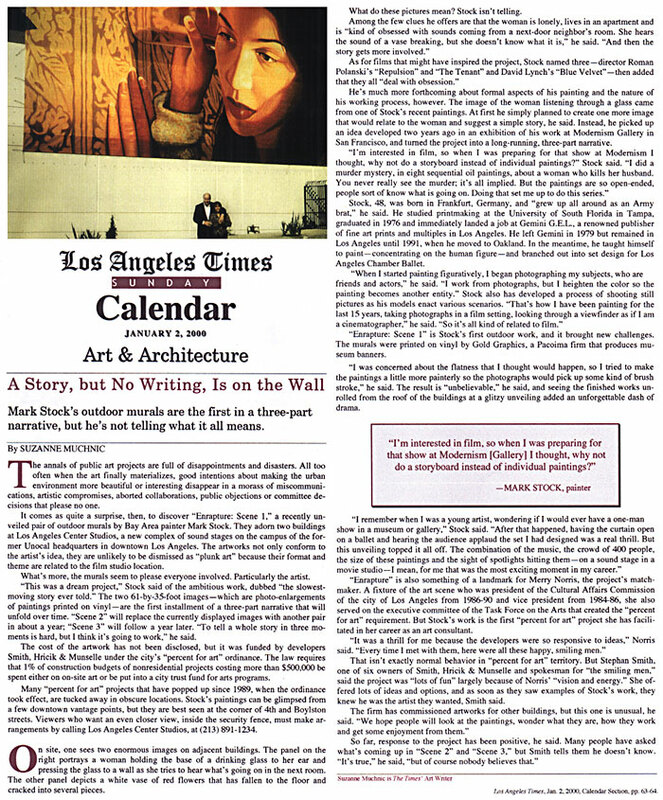 CALIFORNIA MAGAZINE Romance, theatrics, and most of all, obsession figure in the work of LA artist Mark Stock. 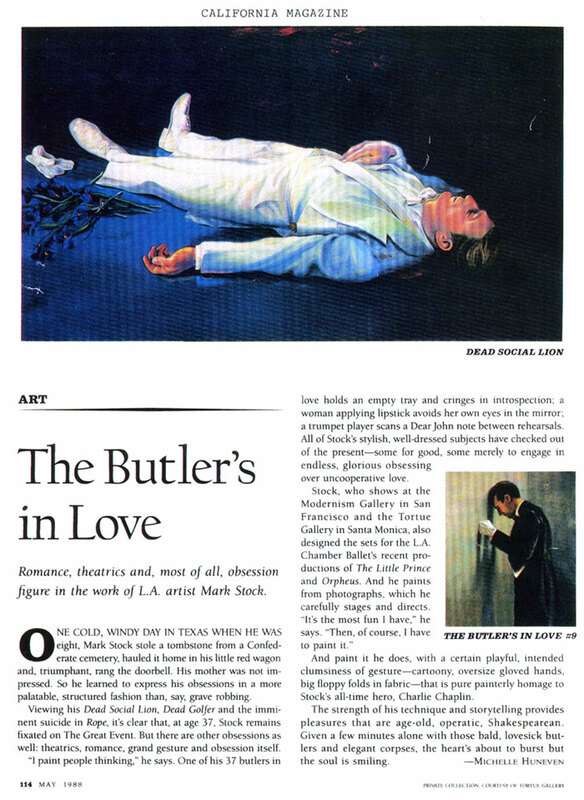 You can't miss "The Butler in Love," and you can't forget him. 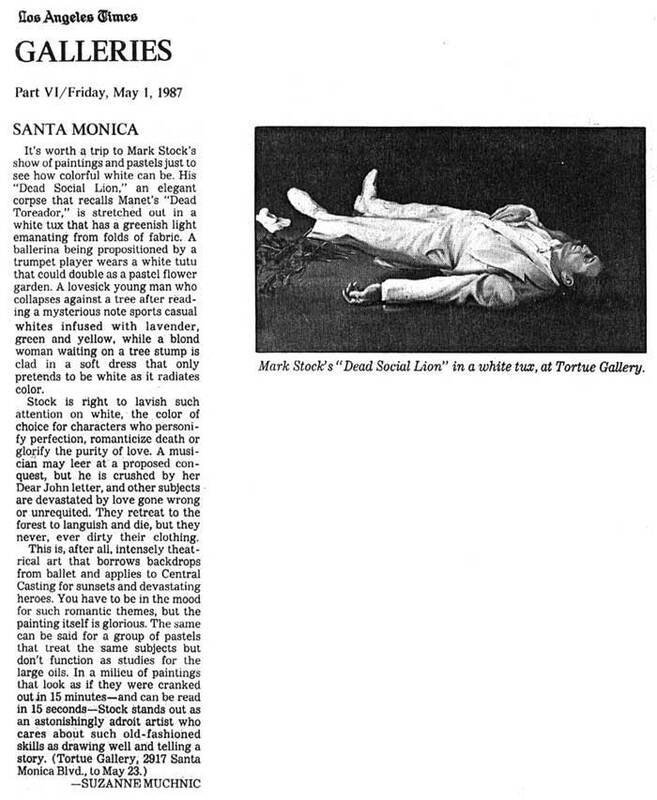 NEW YORK TIMES SUNDAY October 1997 Logan collects psychologically charged, media-influenced figurations. 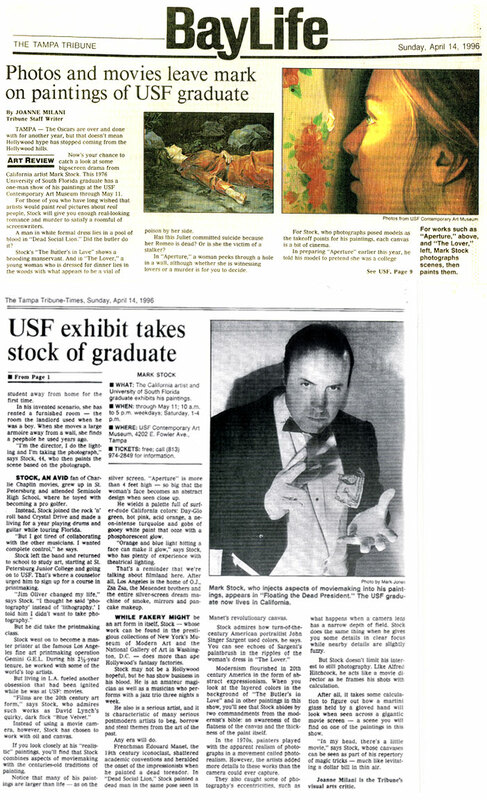 ST PETERSBERG TIMES Mark Stock creates a cast of characters, each on its own canvas. 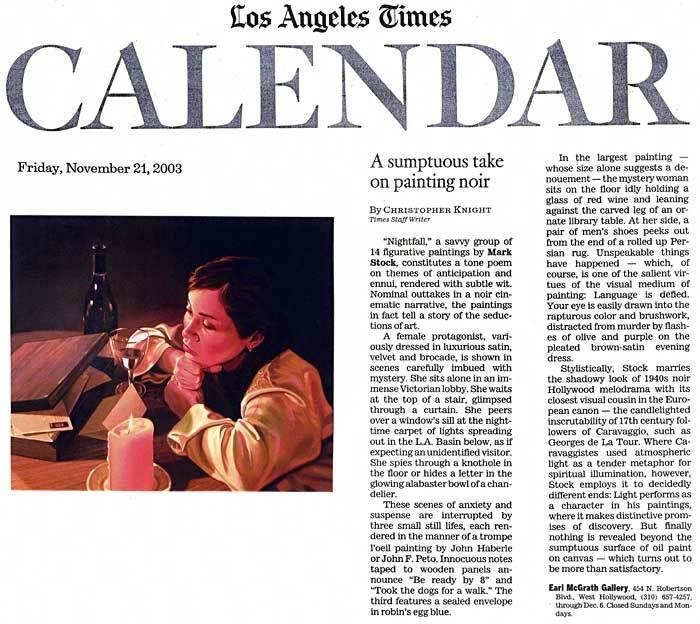 Edward Hopper's artistic spirit inhabits the oils and pastels of these three young Los Angeles artists. 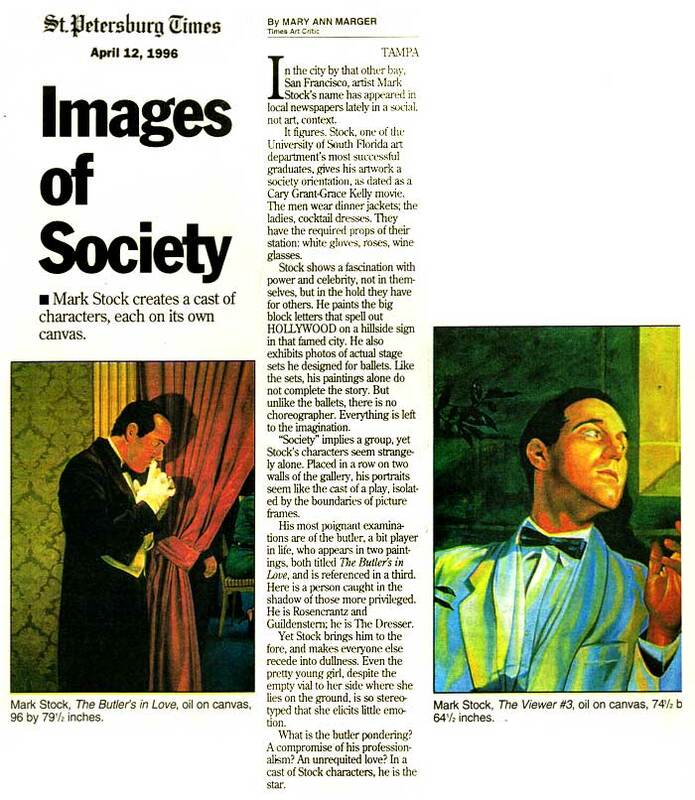 Mark Stock's paintings glow with the burnished warmth of a Masterpiece Theatre miniseries. Stock is the most accessible, his luminous paintings invite us into a cool, tastefully wealthy milieu that's highly seductive. Stock stands out as an astonishingly adroit artist who cares about such old-fashioned skills as drawing well and telling a story.